Marquette Bank announced its sixth annual Adopt-a-Classroom prize drawing. Through Saturday, Sept. 8, Marquette Bank customers, local teachers and parents can enter at any Marquette Bank location for a chance to win a $200 gift card for any elementary, junior high or high school classroom in Illinois. The gift cards can be used to purchase any educational-related materials. One winner will be selected from each of Marquette Bank’s 22 branch locations. 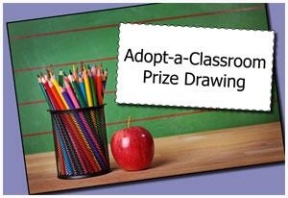 The Adopt-a-Classroom prize drawing is part of the Marquette Neighborhood Commitment to support education. Each quarter, the bank focuses on a different area of need, including shelter, hunger, education and health/wellness. For more information about Marquette Bank and its Neighborhood Commitment, visit www.emarquettebank.com/neighborhood or call 1-888-254-9500.